So far, no CANDU nuclear power plant has ever been confronted with events or accidents threatening people’s health and safety. Despite the fact that these risks are as much as possible minimized, as the plant is equipped with nuclear safety systems designed to prevent and cope with such events, additional measures are also taken for people and environment protection. Among such measures, we mention the emergency preparedness, required by the national law as a pre-requisite for licensing the operation of a nuclear power plant. 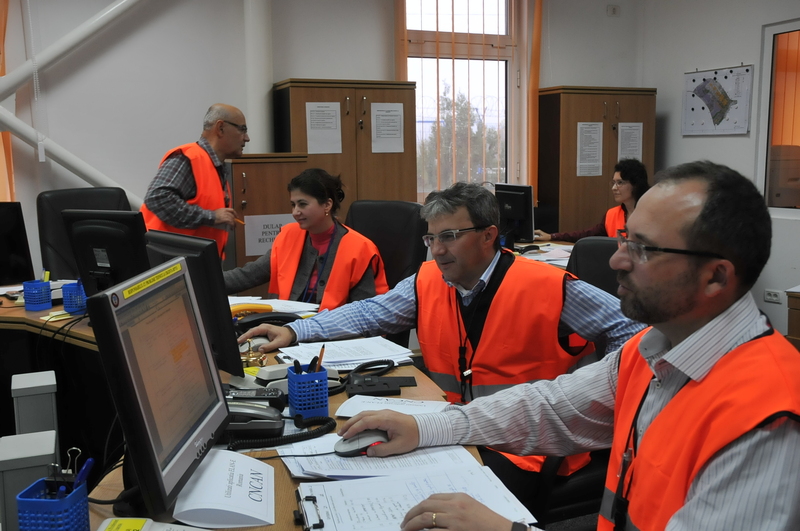 Within the Cernavoda NPP, the emergency preparedness is verified and improved through quarterly, annual or general drills and exercises (once every three-four years) which are simulating various conditions of a nuclear accident. Starting with the year 1995, national and even international emergency exercises have been performed at the Cernavoda NPP: “AXIOPOLIS ‘95”, “SAFE POWER ‘96”, “PHOENIX ’97”, “DOBROGEA ’98”, “DUNAREA ’99”, “MILLENNIUM ’00”, “AXIOPLOS ’01”, “EURO ’02”, “CHALLENGE ‘03”, “EUXIN ’04”, “CONVEX-3 ‘05”, “START ‘06”, “EUROPA ‘07”, “OLIMPIA ‘08” and “AXIOPOLIS ‘09”, ”FAURAR ’10”, ”GERAR ’11”, ”BRUMAR ’12” and “SATURN 13″. On April 10, 2006, the On-Site Emergency Control Center was brought into service, in a specially fit out space where the activities related to an emergency response are conducted and co-ordinated. In 2011, reinforcement works were performed on the On-Site Emergency Control Center with a view to qualifying this structure for a seismic action of DBE level (Design Basis Earthquake at a maximum horizontal acceleration of 0.2 g). 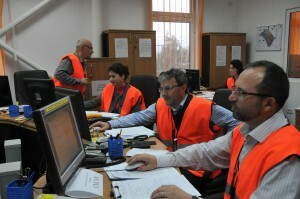 The Cernavoda NPP also continued to develop the project of the Off-Site Emergency Control Center in Constanta (at about 60 km from the Cernavoda NPP), with a view to conduct and co-ordinate the response activities in case of an emergency situation if the On-Site Emergency Control Center would not be available. The measures taken by the Cernavoda NPP after the Fukushima accident have included the elaboration and implementation of new emergency response procedures in case of any situation that might result in completely failing to preserve the power supply or in failing to remove the residual heat from the spent fuel bay, as well as the elaboration of some specific response procedures in case of severe accidents. These measures also included: personnel’s specific training for applying the new procedures; ensuring electric power supply facilities out of independent sources, meaning mobile diesel generators; and the implementation of some changes to the design in order to provide additional cooling water sources in case of a severe accident. The Cernavoda NPP has also started to fit up a Work Permission Area on the campus site (at about 2 km from the nuclear plant), for the operation staff and the emergency team in case of a sever accident, when they would no longer be cabable and allowed to perform their activities in the nuclear plant on a continuous basis because of the radiological conditions. In order to preserve the valuable, positive experience and to maintain the present emergency response arrangements with the Public Authorities properly qualified to address emergency response activities, SNN SA is promoting a very good co-operation with the national authorities in charge, while the Cernavoda NPP with local authorities (Cernavoda town and Constanta county). In this context, the Cernavoda NPP has prepared and arranged two important facilities for the town of Cernavoda: the Local Emergency Center of the Cernavoda Town Hall at the Cernavoda NPP’s Public Information Center in the Cernavoda town and the Personnel Decontamination Area within the Cernavoda town hospital.